Spanning the Crimean War, the Siege of Carlisle and the near-future of 2019 and 2039, they find themselves sacrificing their lives to save the world. But why do they keep coming back? What else must they achieve before they can be left to live and love in peace? 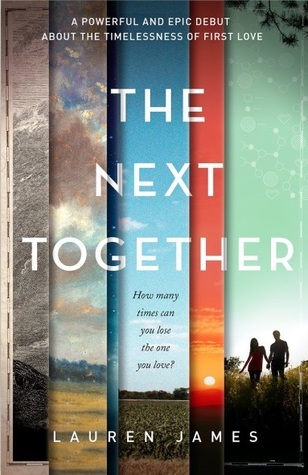 The Next Together is told through a mixture of regular prose, diary entries, letters, "original" historical documents, news reports and internet articles. Why I am waiting on this? Stories about soul mates and lovers reincarnated are my perfect kind of romance. What? I think it's the only kind of supernatural thing, or bigger order of things, that's actually worth believing in. And a girl can dream, right? x) Plus, I'm really curious about this style to tell a story. I can't even imagine it! I can see the appeal of such stories, they can have a real big emotional impact on the reader . . . In fact, I'm sure this one would have one on me, and I just love that! Whoah, I've never seen anything quite like this synopsis! It sounds really interesting, thank you for sharing! I must admit that I usually don't like stories about soul mates. I've only truly liked a few, but this book sounds remarkable! Definitely adding this to my wishlist! The blurb sounds good. Unfortunately I don't like reading prose, diary entries etc. This sounds amazing! I love books about reincarnation and soul mates 🙂 I don't read many books written in diary entries, letter, articles, etc. but I am still up for trying this one. Thanks for sharing and stopping by! recently posted... The Designed Blog Tour! This sounds like a very great book! And it has gorgeous cover, too! I'm definitely adding this to my TBR. Oh, that cover is so intricate! I actually thought those were book spines, but at a closer look, I realised they are photographs. How nice that they look like book spines still! Anyway, the book sounds interesting, and I hope you like it when you read it. Thank you for sharing and thank you even more for stopping by my post earlier. Happy waiting, and happy reading! I also love soulmate and reincarnation stories! I can't get quite enough of them but only if they're done right.